San Sebastián is the first World Tour race after the Tour de France, and it also sees us begin to turn our attention towards the third and final Grand Tour of the season: La Vuelta España. A relatively young race by cycling standards — it began in 1981 — this is one for the climbers; think Ardennes riders, puncheurs, and Grand Tour riders with an explosive kick. This fairly unique mix of rider-types in play for a one-day race makes it a difficult one to predict, but we’ll get to that one in the moment. It’s also another great promotional vehicle for the Spanish tourist board. The Basque country is famous for its steep and gruelling climbs, and the race shows off the winding coastal roads and the undulating terrain that are tailor made for attacking rides from anyone with some leftover form from the Tour de France. This year, it should be noted, the race will also act as a form test ahead of a not dissimilar mountainous Olympic road race in Rio, only one week later. The race is a meaty 219km long, and has kept largely the same route for the last few years. The main feature of the day will be the category 1 Alto de Jaizkibel (7.8km, 5.8%), which the riders tackle twice — once at 125km, and again at 165km. The climb can be split into two sections, with a kilometre of more level road coming after 3km. Of course, this plateau lessens the average gradient, and it’s much harsher than the 5.8% average implies; the beginning and end of the climb both feature gradients around the 7-8% mark. GCN took a closer look at the climb and give a great insight into how the pros will tackle it. The order of the day will likely be for the stronger riders to make a selection on the Jaizkibel, with domestiques and riders on an off day going out the back as the pace gets ramped up, especially on the second climb. There are two final climbs in the last 55km after the second ascent of the Jaizkibel. 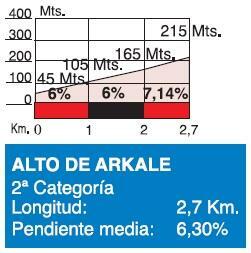 The riders will have already seen the category 2 Alto de Arkale climb (2.7km, 6.3%) , a short ascent with a fairly consistent gradient from start to finish. The race ends with 16.2km finishing circuit, which includes a punchy and painful 1.8km climb to the Hotel San Sebastián, up the Murgil Bidea (the only change to the course from 2015). Its 1.8kms with an average of 10.5% and maxes out at 25%. The last 600m have an average gradient of 12.5%. Murgil is wider than Bordako (used in 2015) and, according to reddit sources, the change was made so that there wouldn’t be a need to erect barriers – in light of the ‘Ventoux’ incident at the Tour. It’s definitely tough and will likely be the place where the race is won or lost from the final group of riders. After this, there is just over 8km to the line, and the riders need to negotiate a technical descent followed by 3km of flat roads, punctuated by tight corners, to arrive at the finish. Depending on what has gone on before, we could see the winner come from a small group sprint, a glorious solo victory, or from a handful of late attackers. We’ll be looking at riders who held something back from the Tour de France, looked to be coming into form in the third week, or else skipped the Tour altogether for other training plans. The man to beat looks to be Alejandro Valverde. He finished strongly in the Tour and also took his fourth Flèche Wallonne back in April. The Olympic road race is his main goal at the moment, and he looks to be peaking at just the right time. This is his type of race, and he is one of the best in the peloton at launching a perfectly timed attack on one of the final climbs. Few would bet against him claiming his third win here. He’ll have Giovanni Visconti for support, who will more than likely be in the morning breakaway ready to work for Valverde later on, and the Izagirre brothers Gorka and Jon to work for him on the climbs and to drive a harsh pace. Valverde could win from a solo attack or a sprint from the bunch, so his versatility here will really pay off. Dan Martin could also make amends for a Tour de France that was altogether excellent, but without a key win. Fresh off his best G..C performance at a Grand Tour, in which he looked to have decent legs in the mountains, he should be able to carry over some form into this race. We know that he excels on short punchy climbs, but the test will be managing the fatigue of competing during three weeks in France. Etixx also have the talented Maglia Rosa wearing duo of Bob Jungels and Gianluca Brambilla. Both can perform on this kind of terrain and could be sent up the road early in a break, or launch their own attacks — as Jungels did so effectively at the Tour of Oman. Czech duo Petr Vakoč and Zdeněk Štybar will also be key men for Martin, and are again also capable of winning the race themselves. A strong squad. The two men at the centre of last year’s race will also be marked down as main contenders again this year. 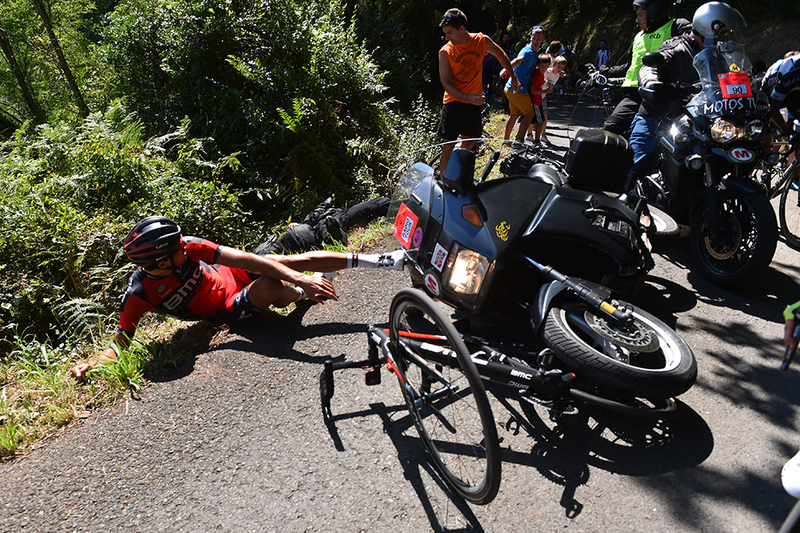 Greg Van Avermaet was cruelly denied a chance at victory due to a wayward moto. He is currently in the form of his life after taking the Omloop Het Nieuwsblad in February and another Tour de France stage win in July (not to mention slipping on the yellow jersey!). Philippe Gilbert, Ben Hermans, Alessandro Di Marchi and Samuel Sánchez will play key roles for him in breaks and on the climbs and are also possible alternative if GVA is off the pace or suffers. The rider who benefited from Van Avermaets’ misfortune was Adam Yates, who went on to take a spectacular win last year. He has a had an amazing Tour de France, and is clearly in some great form coming into this race. He’s also one of Team GB’s options for the Olympic Road Race, so successive wins here could be on the cards. Orica also have Simon Yates and Michael Albasini as viable plan B options, but Adam will be the leader of the team, and they have an inform Daryl Impey — fresh from a great Tour de France where he surprised us with his climbing skills — ready and willing to drive the pace when needed. Jarlinson Pantano was one the revelations of the Tour. He was on everyone’s radar after his stage win at the Tour de Suisse, and he backed up that performance with some expert displays of attacking breakaway racing and fearless descending, resulting in a stage win on Stage 15 and 2nd placing on Stage 17. He won’t struggle to find a new contract (if he hasn’t already got one) once IAM Cycling fold at the end of 2016. He has shown he has the skills and talent to compete and beat the best and a major one day win on his palmares in 2016 would be the icing on the cake. He’s got a great chance of making it into the final selection, and, as he showed in the Tour when racing Majka to the line, he’s got a handy kick to the line to boot. Tim Wellens has been consistent all year, with stage wins at Paris-Nice and the overall at the Tour de Pologne. His trade mark ‘suicide’ attacks don’t always pay off, but when he gets a gap he can be hard to chase down, even for the peloton. He also has strong teammates in the form of Tiesj Benoot, who returned to form at the Tour de Pologne, and Tony Gallopin. The latter had a quiet Tour de France, with the Olympics being his focus, so he should hopefully be moving into a patch of form in the run up to the road race. Sky is a team riding on a high after Froome’s third Tour win, with Mikel Landa and Mikel Nieve representing them here. However, these two did a hell of a lot of work on the front for Froome, so will likely be fatigued coming into this race. Neither are in the Spanish Olynmpic squad (for some reason) so they can go for broke here, but we’re not convinced they will have the legs. Michal Kwiatkowski, on paper, is their best one-day rider, and looks to have put his poor Ardennes campaign behind him with some good performances at the Tour de Pologne. Nicolas Roche and Peter Kennaugh will offer support, with the former building up for Rio and the La Vuelta and the latter looking to ride into some form after a spell out with injury. Tinkoff are a team of mercenaries at the moment, all riding for their own futures next year. Alberto Contador is here, but taking in to account that he is recovering from injury, we can’t see him challenging for the win. Roman Kruziger, who stepped up well to become the team’s G.C. hope at the Tour, will be the likely leader – but will that unscheduled G.C. campaign be a fatigue factor for him? Lampre bring with them the strong duo of Diego Ulissi and Rui Costa. Costa was on fine attacking form during the Tour, especially in the latter week, but came away with little to show for it. He will be looking to continue this form in the run up to Rio, so expect to see him very active yet again. Ulissi had a great Giro, with two stage wins, and he continued this form at Tour de Slovénie last month. He’s another ride with gold medal ambitions and has the sort of explosivity that could take him all the way here, on a good day. Cannondale-Drapac had a dire Tour de France; after putting all the eggs in the Uran basket at the Giro, they were a little underrepresented, and the results failed to materialise. Rigoberto Uran will lead them here, and he has the experienced Simon Clarke and Tom-Jelte Slagter as his main supports and possible back up plans. The team needs a big result soon, but we’re not sure it will come this weekend; still Uran can climb with the best of them, and if he arrives towards the finish with only elite climbers, then his powerful sprint might get him onto the podium. Trek-Segafredo will be led by Bauke Mollema, who showed the best form of his career during the Tour. However, we think that Fabio Felline represent stheir best chance at this race. He performed well at the Tour de Pologne on stage 5, which was a similar distance and tackled tougher climbs. He’s an outsider, but not a ridiculously long shot. Giant-Alpecin don’t come here with a strong squad. Warren Barguil will lead them, but he had a fairly disappointing Tour de France — the only highlight being his good lead out work for the recovering John Degenkolb! Sam Oomen could be a very long outsider, but that would be asking a lot from the young Dutchman. For Katusha, you can never count out Joaquim Rodríguez, but he looked like he had lost that spark of old at the recent Tour, and expect those three weeks to have taken their toll. Ilnur Zakarin, having been removed from Russia’s Olympic squad, may want to prove a point to his national body and the wider cycling public. Expect him to ride with some extra determination! Other riders to look out for include two times winner Luis Leon Sánchez for Astana, Steven Kruijswijk, who is making his first appearance since losing out on the Giro, Dimension Data’s duo of Nathan Haas and Serge Pauwels, and young British climbing star Hugh Carthy. Andy is rooting for Dan Martin to pick up a big win here, to make up for the lack of loot from the Tour de France. His high G.C. placing alone indicates that his form is currently through the roof, and he should go all out here with his super-strong support team. Chris is looking at Adam Yates again. His win last year came as a surprise, but this year it will be down to fine riding and high form. He’ll be buoyed after his brilliant Tour performances, and, so long as the final kilometre marker doesn’t fall on him, one of his long attacks should see him get to the line first. James: Thinks Tim Wellens will take advantage of the other favourites suffering from three weeks in France. A master of late attacks, he expects him to light the race up multiple times until an attack sticks, perhaps on the final ascent of the Alto de Arkale.